From its craggy, snow-capped mountains to its unbelievably cool cities, Canada has so much to explore you’ll wonder how to fit it all in. 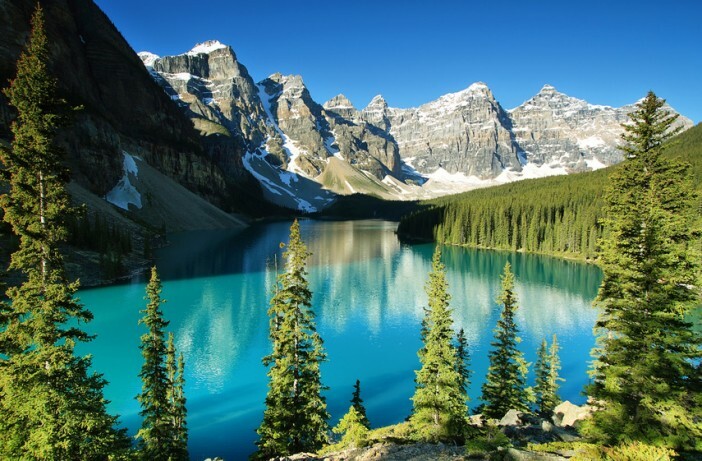 Well, wonder no more, because our spectacular Rocky Mountaineer trip takes you on the ultimate whistle stop tour of this beautiful country, from the cloud strewn mountain peaks to the icy blue ocean. In just two weeks, you’ll get a taste of all that Canada has to offer: hot springs, cool bars, and an enormous helping of natural beauty. Your first stop in Vancouver will be something of a flying visit, but don’t worry, you’ll have plenty of time to explore this stunning city later in your trip. With the glimmering towers of its metropolis rising in stark contrast out of the breathtaking mountains and greenery surrounding it, Vancouver is likely to capture your heart at first sight. Explore Stanley Park to really get in touch with the natural beauty of the place, with its diorama of mountains and unfurling ocean visible from the seawall. If you’re more interested in the delights of the city, head into town and experience the amazing culinary scene that Vancouver has to offer. From authentic Japanese – the izakayas are amazing – to locally sourced West Coast cuisine, there’s something for everyone in the city’s fast growing foodie movement. Even more impressive is the craft beer scene, which has rightly been called nation-leading, as you will see for yourself in Vancouver’s trendy bars. In addition to all this, the burgeoning art scene lends the city an urban edge that is well worth exploring. Basically, you won’t ever want to leave. If anything is worth leaving Vancouver for, it’s the next leg of our trip, which is a cruise exploring Alaska’s stunning Inside Passage. The protected waterway has some of the most stunning scenery in the world and the deep waters let you get amazingly close to the steep mountain walls that surround you. Marvel at soaring glaciers and the intricate fjords carved into the ice by centuries of lapping waves. You’ll stop off at intimate ports of call, including Icy Strait Point which allows you to experience the frosty wilderness that local Alaskans call home. From marvelling at stunning glaciers to exploring the picturesque towns you can hardly believe exist in this beautiful, harsh environment, the Alaskan cruise is bound to be a highlight of your trip. After the life changing beauty of Alaska, you might think that nothing could wow you again, but a hurtling train journey on the Rocky Mountaineer will soon change your mind. Starting in Vancouver and ending in Jasper, this train journey through the highest mountain ranges in the Canadian Rockies and Canada’s West shows the very best of a country that is blessed with untold natural beauty. Experience the gossamer clouds rolling down the jagged peaks of spruce forest that grows like a beard on the snow-capped face of some of the world’s most dramatic mountain ranges. Watch in awe as 750 million litres of water crash through the narrow gorge of Hell’s Gate, a sight which struck the fear of God in to the hearts of Canada’s early explorers. If you’re lucky, you might even spot some of Canada’s famed wildlife, from majestic eagles soaring above to the noble moose that bathe and drink on the shores of Moose Lake. It really is an unforgettable journey. Canada’s National Parks are each more beautiful than the next and it can be hard to know where to start. That’s why this coach tour from Jasper to Calgary is so perfect, letting you experience a few of the highlights that are on offer. People have travelled to the area for decades to appreciate the mountainous beauty and relax in the soothing hot springs, which were thought to have health-giving benefits. Tranquil lakes are surrounded by the intimidating amphitheatre of ancient mountain ranges, that are home to grizzly bears and adorned with glittering glaciers. With trails to hike, lakes to boat on and teahouses for much needed refreshment, it’s impossible not to enjoy exploring these beautiful National Park destinations. The tour ends in Calgary, which with an average age of 35 years old has one of the youngest populations in Canada. This lends the city a youthful exuberance, combining a wealth of fun daytime activities with an unbeatable nightlife. Take a walking tour of the city’s outdoor art installations that earned it the title of Canada’s cultural capital, discover quirky shops for everything from jewellery to knitting in the shopping quarter, or catch a thrilling ice hockey game and cheer for the city’s own Calgary Flames. This amazing trip around Alaska and the Rocky Mountains departs on 22 July 2017 and you could be on it from $6099 per person, including everything from taxes to tours. If you think this cruise could be just the holiday you need, book this cruise online today or call our friendly team on 1300 857 345.